ONE PERSON was killed and 100 displaced from their homes in Obuasi by floodwaters after rainstorm hit several parts of the Ashanti Region on Tuesday. 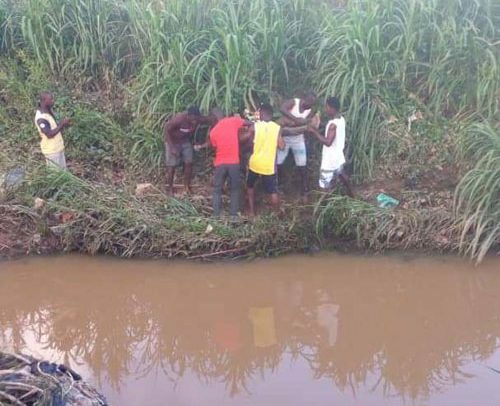 The victim, who was identified as Kwabena Richmond, a 24-year-old auto-mechanic, was found at the bank of river Nyam by local residents the next day. He is believed to have been swept away by flashfloods in his attempt to recover his sandals that got stuck in the floods, while walking home with some friends during the rainstorm. DAILY GUIDE gathered that Richmond, who was allegedly intoxicated, ignored warnings from his peers to leave the sandals he had personally thrown into the floodwaters behind. He was said to have consumed doses of tramadol after work around 7:00 pm, leaving him intoxicated prior to the rainstorm. His body was recovered a day after the heavy downpour around 3:30 pm when his neighbours found him missing from home at Hweaseamo community, a resident narrated. Meanwhile, several homes were flooded displacing more than 100 people on Tuesday night as a result of the rainstorm which battered the Obuasi Municipality. Kunka Junction, Abundant Grace and Obuasi Stadium Junction were among the worst hit areas, with several homes flooded. The District National Disaster Management Organisation (NADMO) Coordinator, Bismark Osei Akowuah, who talked about shocking scenes of flooding, said timely intervention of personnel of NADMO and Ghana Fire Service saved lives and property. He blamed the flooded situation on the choking of drainage systems and pledged his commitment to ensure that they were de-silted.